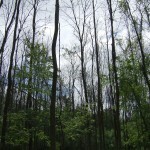 “In 2006 we started establishing observation plots across Ohio and into Michigan so that we could follow the decline of trees and the impact on the ecosystem,” Flower said. In this study the researchers wanted to see if native bark-foraging birds, including woodpeckers and nuthatches, were feeding on the emerald ash borer. They hoped that unlike other exotic invasive species which run amok in new regions because of the lack of predators to keep them in check, the emerald ash borer might meet its match in native predators—bark foraging birds like the woodpecker and nuthatch. This kind of “bio-control” would be as, or perhaps more, efficient than other methods to slow the spread of this pest, said Flower. Chemical treatments are expensive and may cause harm to trees and other fauna, and the introduction of an ash borer predator from its native range in Asia might bring with it a host of new problems, he said. One of the ways a predator can respond to a new abundant food source, according to Flower, is a functional response: the woodpeckers alter their behavior in a way that allows them to find emerald ash borers more efficiently and then consume them more than other prey. One woodland area being monitored lay behind Dempsey Middle School in Delaware, Ohio. The researchers enlisted the help of schoolchildren to do a precise accounting of bug and woodpecker activity in the area, said Christopher Whelan, an avian ecologist with the Illinois Natural History Survey, UIC adjunct assistant professor of biology and a co-author of the study. 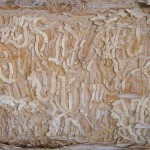 When emerald ash borer larvae emerge from eggs laid on the tree, they burrow in and eat their way through the phloem layer of the tree, the vascular system that delivers water and nutrients from root to branch. The insects create characteristic serpentine galleries that cut this vascular system, starving the tree. Eventually mature adults exit the tree to start the process again. A section of trees in the stand behind the school was cut down for examination each year for two years. The students searched for and painted all the holes they found in the bark of each tree—a different color each for large round woodpecker holes, for the characteristic crescent-shaped holes mature emerald ash borers make exiting a tree and for holes made by other insects. 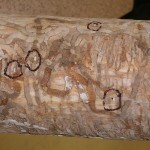 Paint seeped through to dye the stem beneath, and after the bark was stripped the students could identify woodpecker holes that penetrated into emerald ash borer galleries, or into holes made by other bugs. The students tracked the fate of each bug that had been in the tree. Instead of relying on a statistical estimate of the insect population and thus the food source available, every bug and its fate were accounted for. “This was looking at woodpecker foraging at a fine tree-by-tree scale,” said Flower. Their results proved that woodpeckers were indeed choosing to prey on emerald ash borers–eating 85 percent of the emerald ash borer in an infested tree. Another type of predator response to a new food source is a numerical response: the numbers of the predator, in this case woodpeckers and other bark foraging birds, increase either because they were moving into the area or reproducing more successfully. 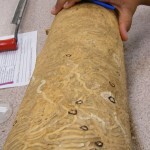 In a related study, researchers at Cornell tracked the movement of emerald ash borer from Detroit and around the Great Lakes using a citizen scientist data base—the Project Feeder Watch—which showed that the numbers of three woodpecker species and the white-breasted nuthatch, the important bark foraging birds in this region, increased as the emerald ash borer increased. “But that study examined the bird population response and didn’t tell you what the birds were doing there,” said Flower. “With the numerical response they found and the functional response we found, we have really powerful evidence of the potential of the woodpeckers and the nuthatch to have an impact on the population of the emerald ash borer,” said Whelan. Very little is known about emerald ash borer habits in its native environment, its natural predators, or how its population is controlled, said Flower. Slowing its course may give researchers time to learn more about how it can be controlled. “Woodpeckers won’t save a tree once it’s infested, but they may save the forest. Or at least save a nearby forest,” said Flower. The research suggests that the woodpeckers are likely slowing the spread of emerald ash borer. “Woodpeckers may not be able to snuff them out, but they may be able to control them,” said Whelan. Lawrence Long, The Ohio State University, Wooster, Ohio; Kathleen Knight and Joanne Rebbeck, USDA Forest Service, Delaware, Ohio; and Joel Brown and Miquel Gonzalez-Meler, UIC, were co-authors on the study. This research was supported by NSF grants DGE-0549245 and DEB-0919276, UIC Hadley grant and Provost Fellowship, and US Forest Service Northern Research Station Civil Rights Diversity Special Project Fund.